The Polish left-wing think tank Fundacja Naprzód (Forward Foundation) has published with a financial support of transform! 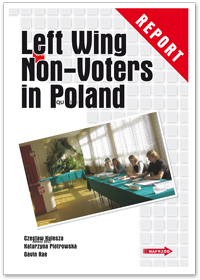 europe a report on the topic of of left-wing non-voters in Poland. For the first time in modern history, the left has no representative in the Polish parliament. Yet just over a decade ago the left had won both the parliamentary and presidential elections. The left remains weak and divided and simultaneously around half of the electorate regularly do not vote in elections. One of the main tasks facing the left is therefore to work out how it can win the support of those who may be drawn to left-wing ideas and policies but do not participate in the electoral process. With this aim in mind the Polish left-wing think tank Fundacja Naprzód (Forward Foundation) has published a report on the topic of of left-wing non-voters in Poland. The report combines secondary analysis of data looking at patterns of non-voting and who non-voters are; with primary questionnaire and interview data on the political opinions of left-wing non-voters, the reasons they give for not voting and what the strategies of left-wing parties are towards engaging non-voters. The report shows how those who do not vote tend to be those from the most disadvantaged and excluded sections of society. Those who define themselves as being left-wing are attracted to clear left-wing policies, that include state intervention, reduction of social inequalities, support for sexual rights, etc. However, left-wing non-voters have less ideologically defined opinions than left-wing voters. Left-wing non-voters are in general disillusioned with politics in Poland and feel that left-wing parties had betrayed them when in power. The report concludes that left-wing parties need to present a clear left-wing programme to the electorate. There is no large group of voters who are waiting for a new left-wing party to be formed. However, there is a significant group of voters who could be attracted to voting for a left-wing party. In order to win these people’s support left-wing parties should present clear, practical policies that are aimed at improving their living standards. They are less likely to be attracted by left-wing slogans, although most of them hold left-wing opinions on issues such as history and social and cultural issues as well as on economics. There is virtually no support amongst left-wing voters and non-voters for a third-way/Blairite social democratic programme. Unfortunately, no left-wing party in Poland at the moment has a developed strategy for attracting the support of left-wing non-voters. We hope that this report will go some way to helping the left in Poland forge a strategy to winning back the support of some of those that have deserted it over the past few years. Who are Non-voters in Poland?